Lane was an exemplary high school student. He was member of the model U.N. and was enrolled in a number of A.P. classes to prepare him for his number one college pick, Stanford University. Unfortunately, his plans were derailed when he was diagnosed with an incurable strain of tuberculosis. Like many teenagers diagnosed with this devastating disease, Lane has been sent to Latham House. Latham House is a combination of an advanced medical centre and boarding school. On his first day, Lane recognizes a girl he met at a summer camp years ago. He remembers Sadie as a shy person who kept to herself. However, the girl he once knew has completely changed. She is outspoken, sarcastic and utterly fascinating. Sadie and her group of friends are completely different from the other residents at Latham House. The group breaks the rules, obtain illicit items for fellow residents and in doing so, live life to the fullest. After spending days and weeks together, Lane and Sadie start to fall in love. Unfortunately, as their love blossoms, their friends' health begin wilt. 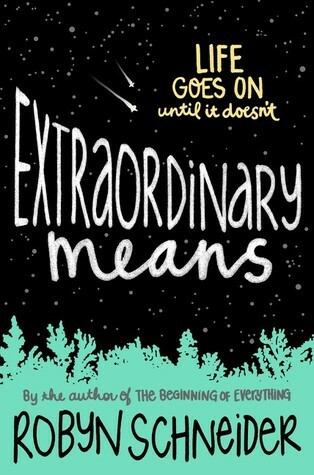 Extraordinary Means is a witty story about love, friendships a hope for second chances. I enjoyed this book because the characters were real. They were flawed, made mistakes and were easy to relate to. I saw pieces of my teen aged self in each of the characters. These flaws also made the story a bit more believable. Another aspect of the book that I greatly enjoyed was the author's creativity when it came to technology. Each of the students are given electronic bracelets that allow them to unlock doors, track their health statistics and location while on Latham grounds (think Disney Magic Band crossed with a Fitbit and GPS locator). I thought the concept of these bands was very imaginative and may actually exist one day, if they don't already. Extraordinary Means was well written and thoroughly researched. The inclusion of a new, incurable tuberculosis strain was very inventive. It allowed for all of the characters to be secluded and quarantined. Schneider's descriptions of the symptoms that the residents suffer from were vivid and believable. Lastly, the potential for a cure helps keep readers at the edge of their seats while they wait to see if it will arrive on time. This is the first book that I've read by Robyn Schneider and after reading it, I immediately purchased The Beginning of Everything because I enjoyed her writing style so much. I hope it's just as great. Disclaimer: I received an Advanced Reader's Copy of Extraordinary Means from Harper Collins Canada (HCC Frenzy) as part of the HCC First Reads program. All opinions are my own. This actually sounds like a great read. I think I might actually want to check this one out! If you are searching for the most recommended Bitcoin exchange service, then you should choose YoBit. Over at Moon Bitcoin you may get FREE bitcoins. 163 satoshis every 1 hour.